This one is now vying for the top of my list... Oh my. Oh yes. You found the winner. Esp. 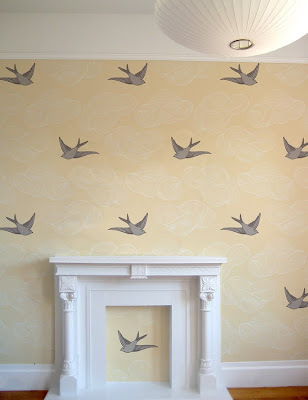 with that periwinkle in Millie's room paired with the grey of the birdies - perfect. This is perfect! None of the three prior ones were speaking to me but this one has the right amount of whimsy and I think it would work beautifully with the existing elements! I do love this pattern. I'm just wondering though...will it grow well with her or will it be too "childish" down the road? I'm pulled between this and the first flower pattern you showed below. that's the ticket. love it! it seems to be unanimous. this is the one. Oh, my this is lovely! Also, it is just so cute that they wallpapered inside the fireplace! This one's very sweet... And I do love the element of whimsy in it... I actually posted a photo of it used on a ceiling today (not that I'm suggesting you do that in Millie's room)... I wouldn't worry about her outgrowing the print like someone else mentioned above... I mean, that's a risk you run with any of them -- it's part of the risk we all take when putting up wallpaper or painting a wall. And that's okay. We're allowed to change our minds, you know? It's part of the fun -- having your space change and grow with you. I think this one really goes with what you already have going on in the space... What does Millie think? I love this one. It's so perfect for a little girl's room! I love this one best! this is THE ONE! fantastic! pick this one! I love this wall paper, I've been walking around my house trying to think of the perfect place for it. i am in love with birds and think that they are perfect in any room of the house, but especially a child's room. ooh ooh LOVE!!! and then you wouldn't have to change the entire color scheme!! btw i have some Dwell for Tarjay pillows that would go great with that. i no longer use them, so if you want them, they are yours! this one is my favorite! it's so simple lovely. Toooo lovely... way to fashionable for my meager interior design budget. Ah. If only I could paint like David Bromstad! Carolyn -- oooh i think of know those Dwell for Targe pillows of which you speak. I'd love to have them!!! this is it. so good. You and Dooce! I love this one and would put it at the top of my list too if Millie likes it! MemeGRL...ooh I didn't even know Dooce used this paper, thank for the tip, it was helpful to see other shots of the paper in action on an actual wall! This one is my favorite also. I've had this wallpaper bookmarked for a while and just need a place to use it. This is the best on of them all, in my opinion! Very , very pretty in a grown-up way ! I love it . insanely cute. why doesn't my house have an old filled-in fireplace for decor sake? It is a sad life in a 50's LA bungalow. Bungalow being a generous term. It's Cole & Son's Cow Parsley. oooh cow parsley is my fave... we have this in several spots in our house. I considered this in yellow, but was worried it might be cow parsley overload! Your daughter's room is GORGEOUS!